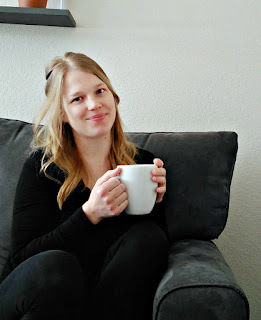 My very second post on this site was on making fleece liners for cloth diapers. For almost a year and a half, it was my go-to method for dealing with poop in cloth diapers. I didn't like that I was still throwing money out (no matter how little) and creating waste by using them., especially once I had two in cloth. I stopped using them completely, and went to dunking and swishing the poop off into the toilet instead. This post contains affiliate links. Purchases made through these links help support this blog by giving me a small commission, at no extra charge to you. Thank you! 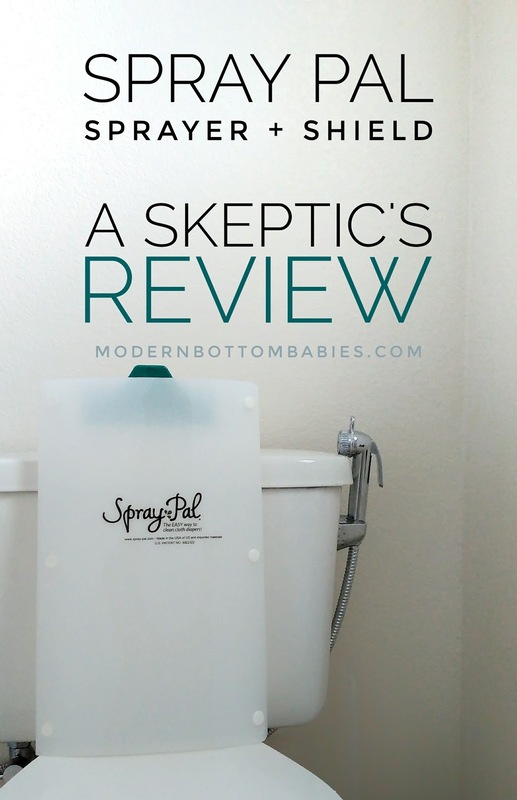 I'm all about simplicity when it comes to cloth diapering (and most things), so up until this point, I had always thought that diaper sprayers were excessive and unnecessary. And honestly, they seemed like more of a hassle to use than not. Dunking and swishing wasn't bad, really. But one week my kids beat their all-time-high poop record and trying to swish poop out of leg gussets just wasn't cutting it for me anymore. I realized that a diaper sprayer was probably going to make my life easier. It happened to be during Black Friday sales, so I purchased the Spray Pal sprayer and got the shield for free. I anxiously waited for it to arrive, and hooked it up immediately (which was a super quick and easy process). Then I waited for someone to poop. Of course, this didn't happen for two days, and when it did, it was a plop-able. Sigh. For once, I actually wanted a good 'ol nasty mess to truly test it out. Fortunately (or not), in the six months since, I have gotten plenty of them. 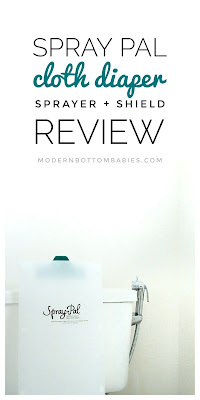 This diaper sprayer is one of my favorite cloth diapering purchases ever. It has a nice, powerful spray that cleans even the worst of poops these little guys can come up with. It's easy to attach, use, and saves money and resources over diaper liners. The spray shield keeps all the mess contained so I can spray the literal crap out of diapers without fear of a poop facial. It has a clip to hold the diaper in place, but to be honest, this is something I never do. I just hold unto the diaper and shield with one hand, and spray with the other. It snaps apart so that you can squeeze the water out of the diaper (I rarely do this either), fold it down for more compact storage (like in a wet bag), and open it all the way flat to clean it really well (I love to do this in my bath tub with a scrub brush weekly bi-weekly monthly sometimes). I cannot stress enough how much I need the shield for the sprayer. Without it, spraying would take longer because I'd have to spray slowly with less pressure to prevent back-spray, and I would never be able to get them so clean. The whole process together is quick and effective, and definitely has simplified my life. Not a week goes by where I don't think to myself, multiple times (usually with a particularly scary poop diaper in hand), how thankful I am for this bundle. It is now one of my most highly recommended cloth diaper accessories. The whole bundle retails for $70-$80. It is usually the best price on Amazon. I REALLY wish I had bought one much, much sooner. I absolutely LOVE it and how clean my diapers get before going into the pail. 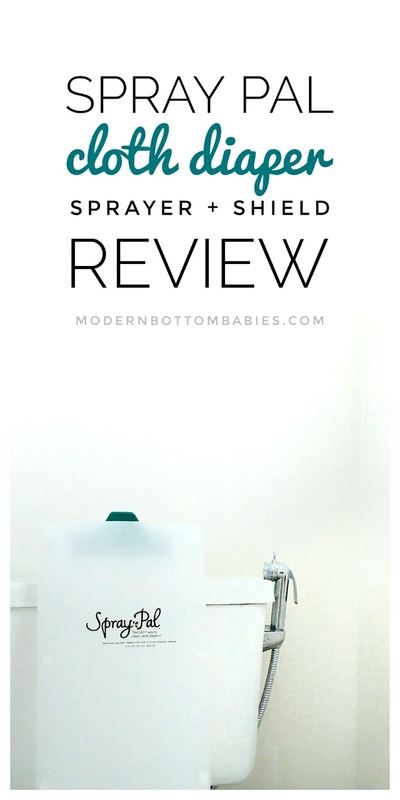 Do you use a diaper sprayer? 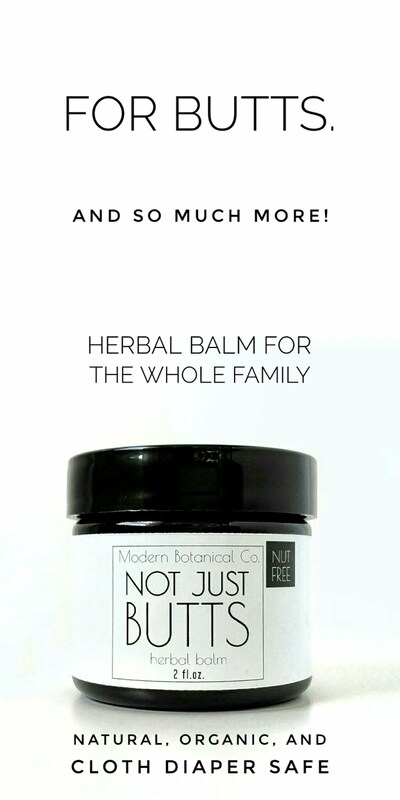 See all my reviews here.